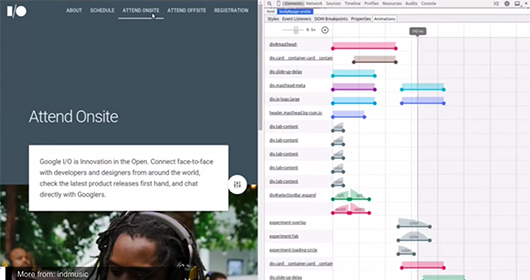 Paul Irish teases with a preview of the Animation Timeline in Chrome Dev Tools. The update adds the ability to pause and fine tune animations. Much like Apples Touch ID, Windows 10 will let you log in with your face or your finger, provided you have the right hardware. Dan Saffer argues that empathy is only a stepping stone on the path to understanding. A report from John Maeda on how design is shaping tech and suggests mobile as the accelerator. tl;dr: 4 reasons why design is taking over Silicon Valley. Bryn Jackson and Brian Lovin chat to Erika Hall about everything from user research to gender in tech, the Apple Watch and the evolution of San Francisco culture. Erika Hall’s excerpt from ‘Just Enough Research’ went down a treat in our last issue, and Brian also wrote about the backstory of their podcast. For it’s 6th birthday Sid Lee Paris create a beautiful, real time dashboard from uninteresting data. The direction of influence between print and digital is reversing – having taken its cues from print design for so long, digital’s flexible design solutions are feeding back into branding. Think The Noun Project, but for Material Design icons. A tumblr full of great micro-interaction examples.